Power is provided by an air/liquid cooled engine, producing 125bhp at 7,750rpm and maximum torque at 6,500rpm. Much like the R1200GS power is delivered to the rear wheel via shaft drive and compared to the outgoing R1200R the suspension now uses conventional upside down forks rather than telelever like R1200GS, while also introducing liquid cooling for the boxer engine. In terms of wheels both are 17" cast Aluminium with 120/70 tyres up front and 180/55 at the rear. Elsewhere there is an immobiliser, power socket, LED rear light and pillion grab handles. For maximum comfort the bike can be purchased with one of three seat heights - check the gallery to see them. Three versions of the R1200R are available with the base model featuring a blue colour scheme. The base model starts at £10,350 and has two riding modes which both work with Automatic Stability Control (ASC). One level up is the £11,600 R1200R Sport, featuring white paint, matching belly pan, red frame and mini sport screen. It also gets Gear Shift Assist Pro, Riding Modes Pro and Dynamic Traction Control (DTC). The top of the line £11,800 R1200R Exclusive comes in dark grey and features Dynamic ESA, identifiable by the gold forks. There is also cruise control, On Board Computer Pro (two extra riding modes) and LED indicators. In terms of practicality there is a centre stand, luggage platform and pannier fastenings although it loses the mini screen from the Sport. 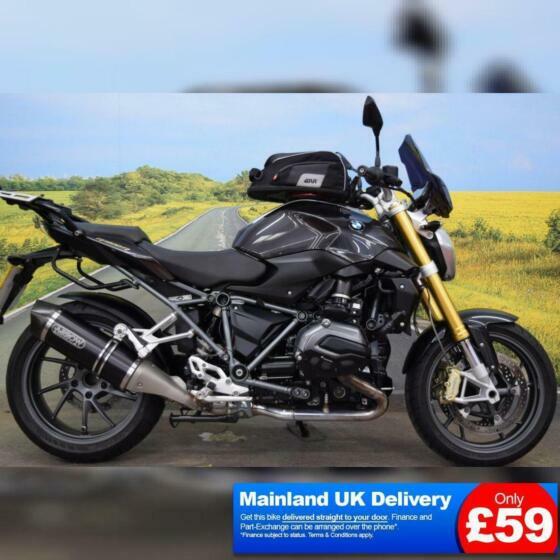 £450 Comfort package adds a chromed exhaust, heated grips and tyre pressure control. £1,390 Premium package gets you dynamic suspension adjustment (ESA), cruise control, sat nav prep, pannier mountings and luggage grid. Basically the Exclusive model. £740 Dynamic package adds two new riding modes; Dynamic and a user programmable mode. There are also LED indicators, running lights and a the mini screen. If you want many of the options, most likely including the gold forks, it's likely to be worth going for the Exclusive model to begin with, saving quite a bit on adding them all individually.